If you live in a dense, urban part of any city rife with condos and apartment towers, chances are you've heard it. A ghostly barking coming from somewhere close, but not quite seen. It's the plaintive howl of an invisible dog. You just might see some frustrated animal on a distant balcony, dying, sometimes literally, to be anywhere else but on that concrete slab. 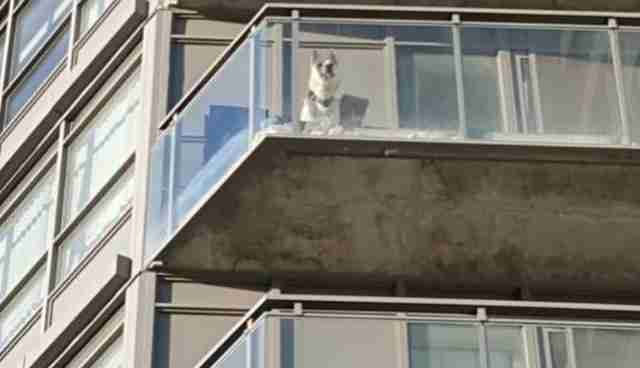 Balcony dogs may be the latest scourge of condo culture - pets that exist in a kind of purgatory, neither outside enough to satisfy their needs, nor inside enough to be safe from the elements. "A balcony for a dog is a cement slab with bars. It's no different from a prison cell," Nicole Simone, founder of Redemption Dogs, a Toronto-based organization that raises awareness of shelter dogs through photography, tells The Dodo. Simone has been spearheading a local campaign to pressure Toronto's city council into enacting a new law that would limit the amount of time pets can be kept on balconies. Her online petition has already received more than 1,000 signatures since Friday and garnered national media attention. Until then, Simone sees the problem of balcony dogs only getting worse. "The dog population is booming in Toronto," she says. Factor in an influx of young people snatching up condos and an increasingly crowded cityscape - and it's not difficult to see where this is heading. 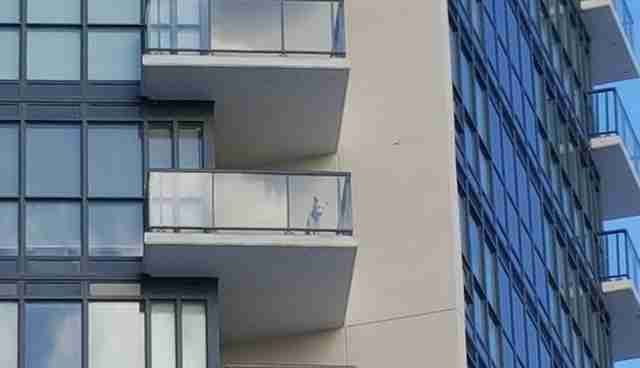 Just weeks ago, one of the city's densest condo enclaves, Liberty Village, made headlines around the world after a dog was spotted in sub-zero weather crying and clawing to get inside and away from the 15th story balcony where he had been trapped. But Whitney Hanson of the Humane Society of North Texas says balcony dogs are in a precarious position all year round. "I have seen cases where a dog has either fallen through a bar in the railing or has jumped over a balcony and injured [himself] severely as a result," she tells The Dodo. "If a dog's not getting mental stimulation or getting really frustrated because they can see people and other dogs and action that's going on but they can't get to it," she says, "they may just jump over that barrier and hurt themselves." Summer heat can be just as dangerous for dogs on balconies as a wintry blast. "A lot of people think that the balcony, because it's covered, is proper shelter," Hanson says. "But as the sun is beating down on that balcony, it gets very hot very fast and it can be deadly." John Gicking, a veterinarian with BluePearl Veterinary Partners, echoes her concerns, telling The Dodo so many pets fall from upper floors, there's actually a name for it: "high-rise syndrome." It's mostly seen in cats, but Gicking says there's no guarantee a dog wouldn't fall. Just imagine a dog's likely reaction to a squirrel scampering across the balcony. The problem is becoming so acute, last summer DoveLewis Emergency Animal Hospital in Portland, Oregon, issued a warning about pets on balconies - particularly dogs who typically suffer more than cats after balcony falls. "Many times when dogs fall from upper-level windows their injuries are much worse - sometimes even fatal," Adam Stone, a veterinarian at DoveLewis, wrote in the release. "Dogs typically sustain worse injuries than cats, and injuries from falls like this are more common in the summer." In the release, DoveLewis included several tips on how to keep pets safe while they're on a balcony. Among them? Move patio furniture away from railings to keep dogs from climbing over them and never leave pets on balconies unsupervised. But it's also vital to not mistake a balcony for a yard. "It's not providing the same stimulation that outdoor time in the yard would," Hanson says. "They're not actually able to run back and forth. They can't chase after birds. Or patrol their environment to give them that sense of purpose that they're keeping their home safe." "It's very frustrating for them. Because they can see the outdoor space," she says. "They can see people. They can see birds and other dogs. But they can't get there." And even more alarming, dogs suffering on balconies are often tucked behind railings or too high for most people to see. "People seem to think it doesn't happen because they don't see it," Simone says. "But how much can you see if a little dog is on the 15th floor of a building?" "It's kind of a secret tragedy that happens within cities and communities." The Humane Society of the United States publishes guidelines for what you can do if you see a dog in distress. Most importantly, the group suggests, document everything you see - the date, time, location. And take a picture, if you can. Then contact your local animal control office.